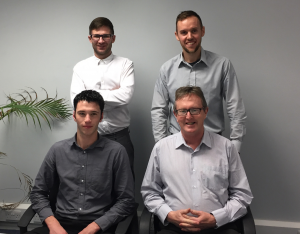 James Kelly Associates are pleased to welcome Simon Forrest and Kyle Walsh to the JKA team. JKA have been steadily growing since its establishment in 2010 and we believe our new staff will allow us to tackle more projects, generate new ideas and provide a consistent high quality service to our clients. Simon Forrest is a Civil & Structural Engineer with over three years’ experience on various residential and industrial projects both in Ireland and Australia. To complement his existing experience and skill set, he has recently completed an International Master’s in Civil Engineering from the University of Bologna, Italy. Kyle Walsh is a Structural Technician who has recently graduated with a degree in Civil Engineering from the Waterford Institute of Technology. The degree has prepared and will allow Kyle to play an important role in our design and draughting process.